In the early 1960s, John F. Kennedy, Martin Luther King, Jr., and Robert Kennedy symbolized hope, change, and the dawn of a new era for a country that was caught in the clutches of Cold War fear, and in many cases, clinging to certain outdated social attitudes. By the end of the decade, all three men laid slain by an assassins’ bullets, with only part of their potential realized. The impact of all three was far reaching and their vision was felt across the country, including in Los Angeles. Neither King nor the Kennedys hailed from the Southland, but when they visited L.A., each was largely welcomed with open arms. Their victories behind the podium or at the ballot box were celebrated by a diverse group of Angelenos, and when they tragically fell, the city gathered to mourn their loss. 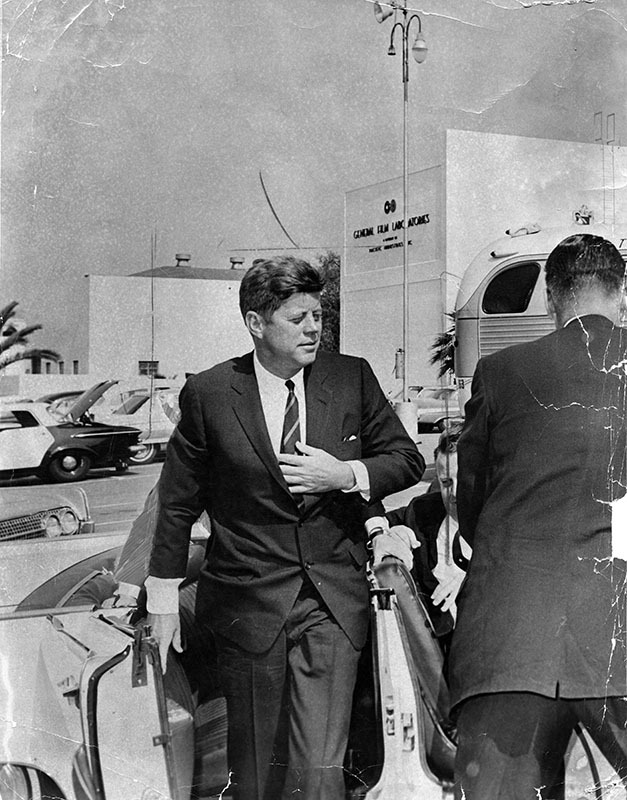 President Kennedy arrives at the Hollywood Palladium for a breakfast sponsored by the Women's Division of the Democratic State Central Committee. When John Fitzgerald Kennedy made a trip to Los Angeles in 1956 to speak at a convention of the Steelworkers Union, the Herald-Express newspaper was so unaware of the Massachusetts Senator that they mistakenly identified him as “Joseph,” his father’s name. Four years later when he secured his party’s nomination at the Los Angeles Memorial Coliseum during the Democratic National Convention, there was no doubt that John F. Kennedy would soon become a household name. When he would return to Southern California after being elected president, thousands would show up to greet and cheer their leader on. 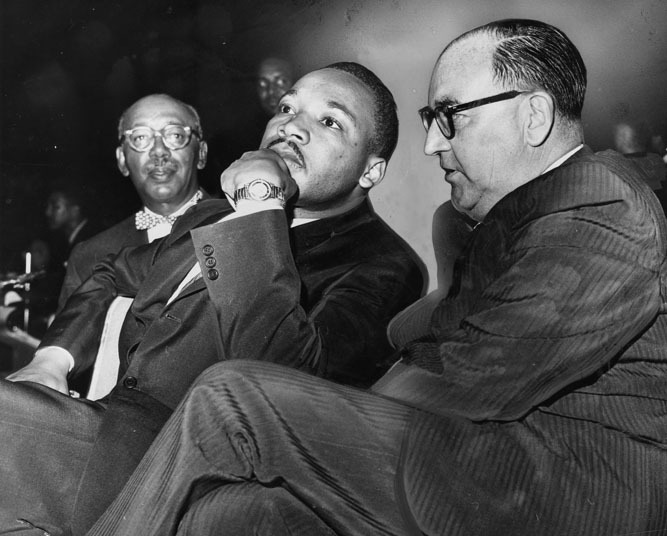 Martin Luther King and Governor Edmund G. Brown during a Freedom Rally at the Los Angeles Sports Arena on June 18, 1961. Martin Luther King visited Los Angeles numerous times during the 1960s, to speak about equal rights and encourage voter participation. The circumstances surrounding these visits were sometimes tense and on occasion even life threatening. King persevered in order to deliver his message to the thousands who would turn out to hear this great orator and Nobel Peace Prize winner. King seems to have been comfortable speaking anywhere and the venues he appeared in were wildly varied, such as the Los Angeles Sports Arena, the Second Baptist Church, the University of California, Los Angeles (UCLA), and the Hollywood Palladium. 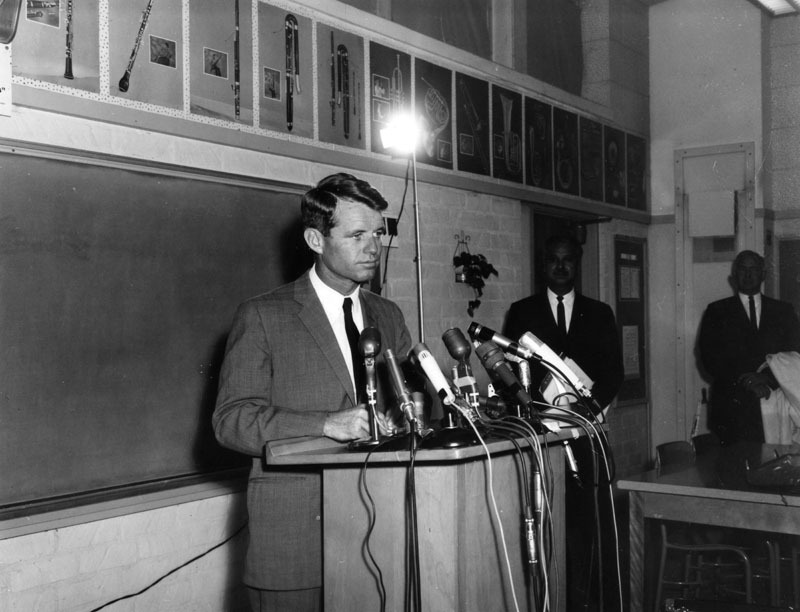 Attorney General Robert Kennedy holds a press conference in the choral room at Markham Junior High School in the Watts neighborhood. Robert Kennedy’s initial visits to Los Angeles as a political figure were in support of his older brother’s presidential campaign in 1960. He later returned to L.A. as Attorney General, crusading against organized crime and encouraging underprivileged youths to remain in school. When he began pursuing his own presidential aspirations, Los Angeles provided a strong base of support and when he won the California primary in June 1968, it was within the walls of the city’s fabled Ambassador Hotel that he reveled in this victory. Tragically, he would also spend his final living moments in L.A. after being gunned down in the wake of the California primary victory. 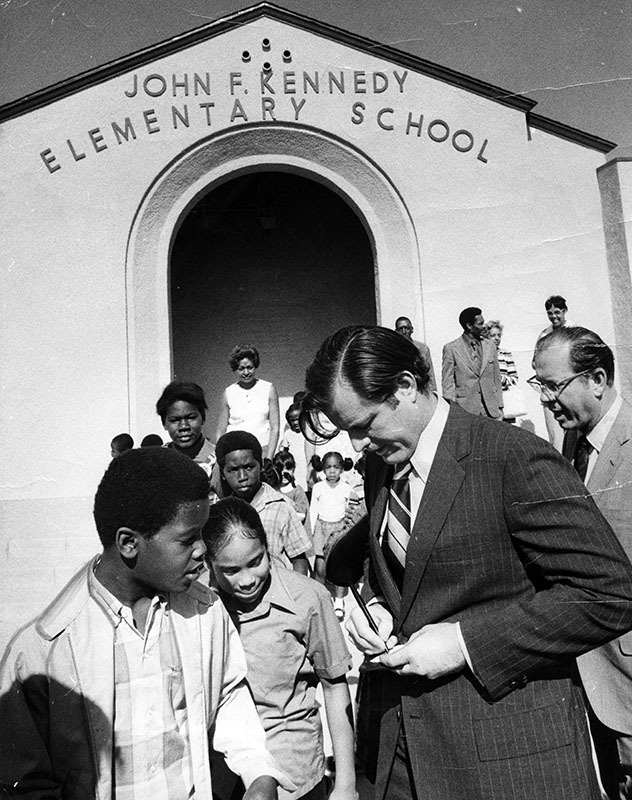 Senator Edward Kennedy visits with school children at John F. Kennedy Elementary School in Compton. As with many cities across the county, Los Angeles mourned King and the Kennedys, both privately and publicly, following their violent deaths. As the years have worn on, tributes have continued with the naming of schools or streets in their honor and various commemoratives. Now, 50 years after the passing of John F. Kennedy, and 45 since the assassinations of Martin Luther King and Robert Kennedy, their impact is still evident in the City of Angeles.